1. Drain beans and reserve liquid. Rinse beans. 2. Heat oil in a 6-quart kettle; add mushrooms, onion, carrots, celery, and garlic and sauté for 5 minutes. 3. Add tomatoes, sage, thyme, oregano, pepper, and bay leaf. 4. Cover and cook over medium heat 20 minutes. Cook macaroni according to directions on package using unsalted water. Drain when cooked. Do not overcook. 5. Combine reserved bean liquid with water to make 4 cups. 6. Add liquid, beans, and cooked macaroni to vegetable mixture. 7. 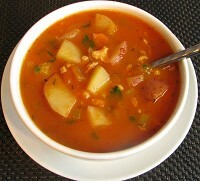 Bring to a boil; cover and simmer until soup is thoroughly heated. Stir occasionally. Tip: *If canned tomatoes are used, sodium will be higher. 1. Heat oil in a large Dutch oven. Add beef and brown. 2. Remove beef from pan, add onions and garlic. Sauté until onions become soft. 3. Add tomato paste and beef broth and bring to a slow boil. 4. Return meat to pan and add the rest of the ingredients. 5. Bring to a simmer. Cover and cook for 1 hour and 15 minutes, or until vegetables are tender. Stir occasionally. 6. Discard rosemary and bay leaf before serving. Nutrition Information Per serving: Calories: 290 Fat: 12g, Carbohydrate: 11g, Protein: 35g, Fiber: 2g, Sodium: 440mg. 1. Heat oil in large sauce pan. Sauté garlic, carrots, celery, onion, and green pepper in oil 3 minutes. 2. Add remaining ingredients except parsley and fish. 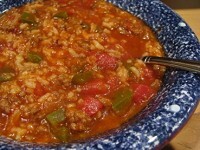 Cover and simmer 10-15 minutes or until vegetables are fork-tender. 3. Add fish and parsley. Simmer, covered, 5-10 minutes more or until fish flakes easily and is opaque. Serve hot. Nutrition Facts: Calories: 170; Total fat: 5 g; Saturated fat: less than 1 g; Cholesterol: 56 mg; Sodium: 380 mg; Fiber: 3 g; Protein: 22 g; Carbohydrate: 9 g; Potassium: 710 mg.
1. Heat oil in a large pot. Add onion, garlic, and cumin, and sauté until onion is softened but not browned. 2. Drain and rinse beans. Add drained beans, tomatoes with liquid, and chicken broth. Heat to a boil. Reduce heat. 3. Stir in tomato sauce, chilies, oregano, and chicken. Simmer 15 minutes. 4. When ready to serve, stir in cilantro and 1 cup cheese until melted. Serve tortilla strips on the side as soup toppings. Notes: To make tortilla strips, stack tortillas and cut in half. Cut each half-stack into thin strips. Spread strips on a baking sheet. Bake at 350 degrees, tossing frequently, for 15 minutes or until crispy and starting to lightly brown. Nutrition Facts: Calories, 170; Calories from fat, 30; Total fat, 3g; Saturated fat, .5g; Trans fat 0g; Cholesterol, 20mg; Sodium, 480mg; Total Carbohydrate, 22g; Fiber, 4g; Protein,13 g; Vit. A, 10%; Vit. C, 30%; Calcium, 8%; Iron, 10%. 1. 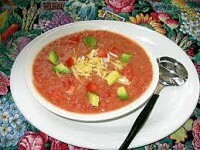 Put 2 cups of tomato juice and all other ingredients except diced tomato, chives, and lemon wedges into the blender. 3. Slowly add the remaining 2 cups of tomato juice to puréed mixture. Add diced tomato. Chill. 4. Serve icy cold in individual bowls garnished with minced chives and lemon wedges. Nutrition Facts: Calories: 87; Total fat: 5 g; Saturated fat: less than 1 g ; Cholesterol: 0 mg; Sodium: 593 mg. Nutrition Facts: Calories, 190; Calories from fat, 0; Total fat, 0g; Saturated fat, 0g; Trans fat 0g; Cholesterol, 0mg; Sodium, 330mg; Total Carbohydrate, 44g; Fiber, 10g; Protein, 8g; Vit. A, 15%; Vit. C, 45%; Calcium, 8%; Iron, 15%. 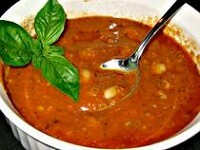 Part of the beans and liquid in this soup is pureed to make a thicker, creamy texture. 1. Combine one can of beans with two cups of the broth in a blender or food processor and blend until a smooth puree. 2. Transfer to a large saucepan. Stir in remaining ingredients. 3. Bring to a boil over high heat, then reduce heat and simmer, covered, about 10 to 15 minutes, or until beans and tomatoes reach desired tenderness. 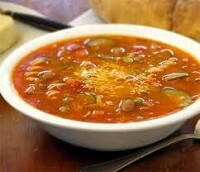 Notes: Use a canned bean without added salt or cook your own without salt to lower the sodium content of this recipe. 1. Cut all but one half of mango into chunks, removing peel and pit; chill remaining mango half for use with garnish. 2. Slice off ¼ of the cucumber and chill for use with garnish. Coarsely chop remaining ¾ of the cucumber. 3. 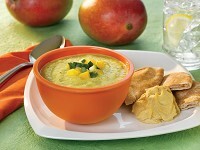 Place chopped mango, cucumber, onion, and pepper (optional) in blender or food processor with lime juice and water. Purée until smooth. 4. Blend in yogurt. Chill until ready to serve. 5. About 15-30 minutes before serving, prepare garnish. Dice chilled mango half, removing peel and pit; dice remaining cucumber. Mix mango and cucumber dices with cilantro. To serve, top bowls of soup with garnish. Nutrition Facts: Calories, 170; Calories from fat, 0; Total fat, 0.5g; Saturated fat, 0g; Trans fat 0g; Cholesterol, 0mg; Sodium, 45mg; Total Carbohydrate, 33g; Fiber, 3g; Protein, 11g; Vit. A, 40%; Vit. C, 120%; Calcium, 15%; Iron, 2%. 1. Scrub potatoes well to remove any eyes or blemishes. 2. 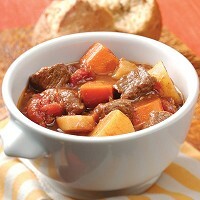 In a slow cooker, combine all ingredients; stir. 3. Cover and cook on low for 8-10 hours or until the vegetables are tender. 4. Remove bay leaf and peppercorns before serving. Nutrition Facts: Calories, 90; Calories from fat, 5; Total fat, 0g; Saturated fat, 0g; Trans fat 0g; Cholesterol, 10mg; Sodium, 55mg; Total Carbohydrate, 16g; Fiber, 2g; Protein, 6g; Vit. A, 70%; Vit. C, 30%; Calcium, 4%; Iron, 8%. Source: Cornell University Cooperative Extension, Eat Smart New York! 1. Heat oil in 4-quart saucepan. Add garlic, onion, and celery. Sauté for about 5 minutes. 2. Add all remaining ingredients except spaghetti. Mix well. 3. Bring to boil and reduce heat. Simmer covered for 45 minutes or until vegetables are tender. Nutrition Facts: Nutrition Facts: Calories: 112, Carbohydrates: 17g, Cholesterol: 0mg, Protein: 4g, Saturated Fat: 0g, Sodium: 202 mg, Total Fat: 4g, Total Fiber: 4g. 1. Blend white beans, onion, and water with a potato masher or blender till smooth. 2. In a large pot, add the pumpkin, juice, cinnamon, nutmeg, black pepper, and salt. Stir. 4. Cook over low heat for 15-20 minutes, until warmed through. Nutrition Facts (per serving):Calories, 140; Fat, .5 g; Cholesterol, 0 g; Sodium, 110 mg;Total Carbohydrate, 28 g; Dietary Fiber, 7 g; Protein, 7 g; Vitamin A, 170%; Vitamin C, 4%; Calcium, 8&; Iron, 15%. 2. Mix flour, salt, and pepper in a medium bowl, and pour over meat; stir to coat. 3. Add remaining ingredients and stir to mix. 4. Cover and cook on LOW for 8 to 10 hours or HIGH for 4 to 6 hours. 5. Stir stew thoroughly before serving. If using bay leaf, discard before serving. Nutrition Facts per serving: Calories, 240; Calories from fat, 50 ; Total fat, 6g; Saturated fat, 2.5g; Trans fat 0g; Cholesterol, 70mg; Sodium, 290mg; Total Carbohydrate, 22g; Fiber, 2g; Protein, 27g; Vitamin A, 100%; Vitamin C, 30%; Calcium, 4%; Iron, 20%. 1. Trim fat from pork. Spray large pan with non-stick cooking spray. Cook half of the pork at a time until browned. 2. While pork is browning, in 4-6 quart crockery cooker layer carrots, onion, thyme, pepper, salt and garlic. Sprinkle with cereal and cherries. Top with pork, once browned. Pour apple juice or cider over all. Cover and cook on low heat setting for 7-8 hours or on high-heat setting for 3 ½ to 4 hours. 3. Prepare the brown rice according to package directions toward the end of the stew cooking. (Brown rice typically takes about 40-45 minutes to cook). 1. In a large pot, heat olive oil over medium heat. 2. Add garlic and cook for 1 minute. Add onions and continue to cook for 2-3 minutes until onions are translucent. 3. Mix in paprika and cumin. 4. Add spinach and cook for 7 minutes. 5. Add garbanzo beans (chickpeas), raisins, tomatoes, and chicken stock. Bring to a boil. 6. Reduce heat to low and simmer uncovered for 7-10 minutes, or until raisins are plump. 7. Add vinegar, salt, and pepper. Mix well. Serve hot. 1. Heat oil in large pot. Sauté onion, asparagus, and potato over medium heat, stirring often, until soft, about 10 minutes. 2. Cover and simmer until potato is tender, about 10 minutes. 3. Add chicken broth, corn, and pepper. 4. Add frozen peas and simmer 1 more minute. 6. Serve hot, sprinkled with cheese. Notes:Leave skin on potato for added fiber. Try using fresh or frozen broccoli instead of asparagus. Try using canned green beans or diced tomatoes instead of peas. 1. Cook hamburger and onion in skillet until hamburger is no longer pink. Drain well. 2. Add all ingredients except rice. Simmer for 30 minutes. Add cooked rice and simmer for 15 to 20 minutes. May add water if needed for desired consistency. Nutrient analysis per serving: 380 Calories, 11 grams fat, 44 grams total carbohydrate, 24 grams protein, 510 milligrams sodium. 1. Heat a large nonstick skillet over medium-high. Add the oil and sauté the onion and garlic until golden, about 2 minutes. 2. Meanwhile, place the flour, milk, mustard and seasonings in a small bowl and mix well. 3. Add the milk mixture to the skillet followed by the corn; mix well until the mixture comes to a boil and thickens, about 3 minutes. Stir frequently to keep the mixture from burning. 4. 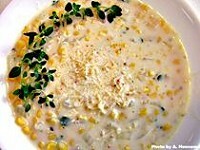 Divide into four bowls and top each with 1 tablespoon of shredded cheese. 1. If you don’t have frozen corn, use canned corn, drained or vacuum-packed. 2. The mustard adds an extra boost of flavor to this recipe; however, if you’re not a big mustard fan or have one of the hotter or spicier mustards, you might start with 1 teaspoon. 3. If you have trouble keeping sauces and gravies from turning lumpy, try using a quick-mixing flour. Nutrition Information: Calories, 350; Total Fat, 13g; Saturated Fat, 3g; Trans Fat 3g; Cholesterol, 10mg; Sodium, 620mg; Total Carbohydrate, 45g; Dietary Fiber, 5g; Sugars, 11g; Protein, 9g. 1. Heat oil in medium saucepan. Add onion, garlic, carrots and celery and stir for 2 minutes. 2. Add potatoes, tomatoes, and water to pan. 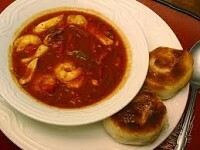 Bring to a boil, then lower heat and simmer 30 minutes or until vegetables are tender. Add turkey and cook another five minutes or until heated. 3. Season to taste before serving. Refrigerate leftovers. 2. Add onion and celery, cook and stir 2-3 minutes. 3. Place all ingredients in a large saucepan (at least 4 quarts). Stir well. Cover and cook about 15 minutes over medium heat stirring occasionally until thoroughly heated. 4. Sprinkle mozzarella cheese on top, if desired. 1. You can substitute 1 tablespoon chopped dried onion for the chopped fresh onion or as recommended on the dried onion container. 2. If you have extra broth, use it instead of water when cooking vegetables or use it for some or all of the liquid in making rice. Use within a day or two or freeze.